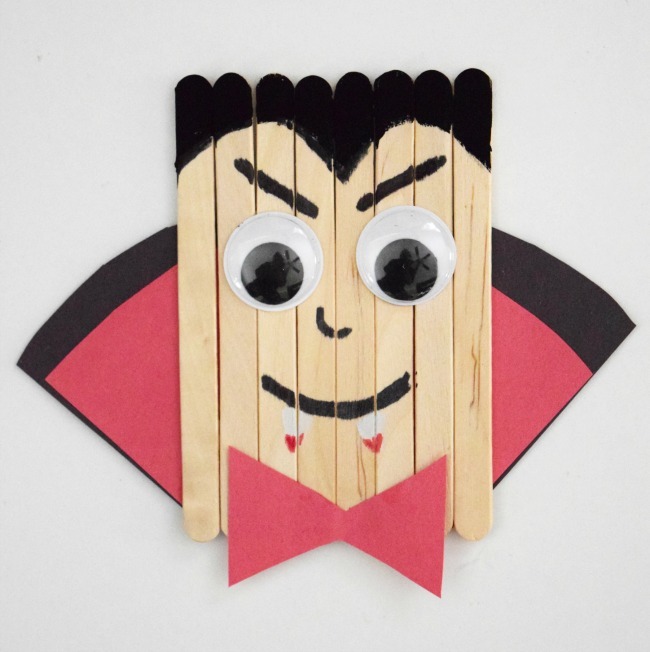 Popsicle stick vampire, this craft embodies the spirit of Halloween. Learn how to make this simple craft stick piece for kids today. This popsicle stick vampire is a lot of fun. 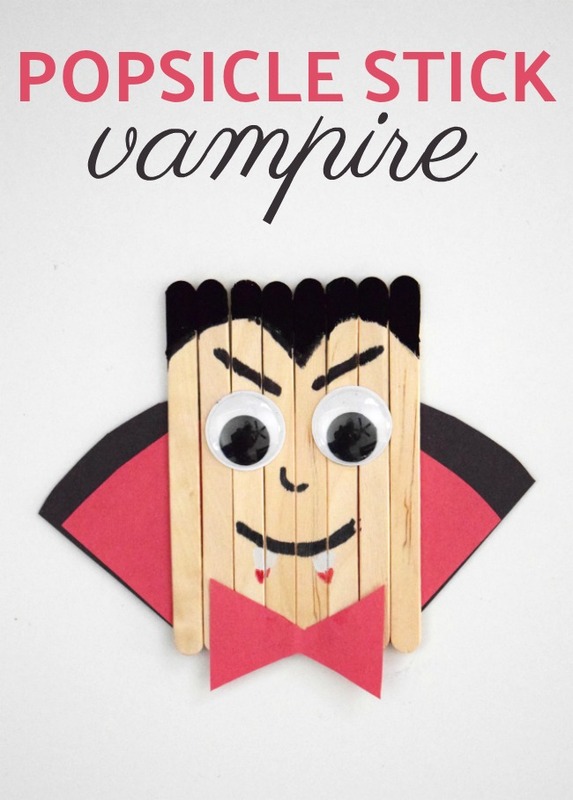 I have a love for all of our popsicle stick crafts but the Halloween ones are some of my favorites. So many spooky characters that you can throw together. We have done several for Halloween already if you haven’t checked those out yet. Lots of crafting can be done this season. First, you will want to start off by cutting out your vampire’s cape from the black and red construction paper. Go ahead and cut out the red bow as well. Now that your pieces are cut you can glue on the craft sticks to the construction paper. After I allowed the craft sticks to dry completely I glued an additional one going horizontally across the back as a support piece. Glue on the bow and now you are ready to start painting. Paint on his hairline, mouth, and nose. You will also need to paint on his eyebrows to give him that devilish look. I like to glue on the eyes first to determine where the eyebrows need to be placed. Once the face is painted you can add the fangs using white and red paint. 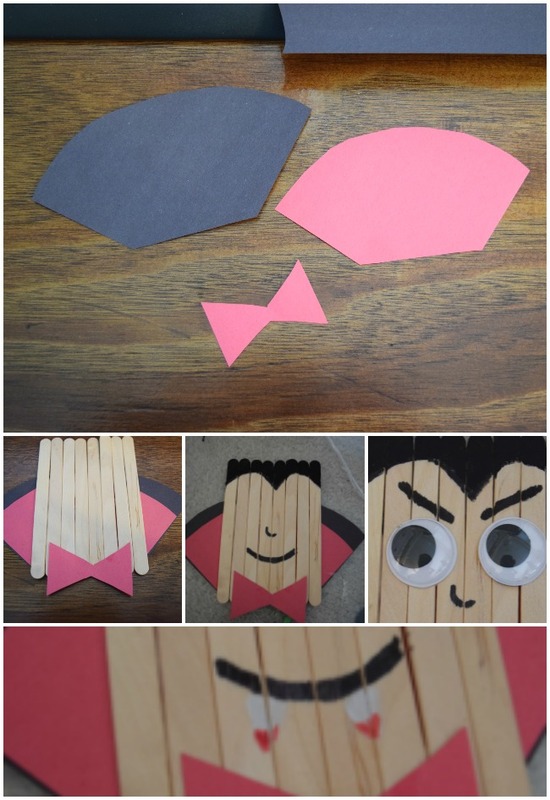 This popsicle stick vampire craft will go great as a arts and craft piece to go along with a fun Halloween read. A few great reads I suggest are Vampire Boy’s Good Night and The Very Thirsty Vampire.